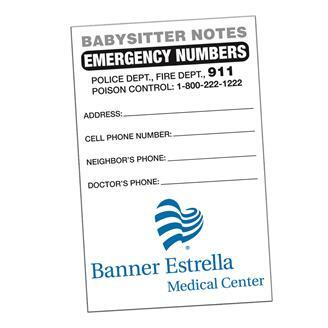 Vital information at your babysitter's fingertips, in case of emergency. Something every home with children should have! Ideal for hospitals, lawyers, health care providers, insurance companies, nurses and more. Prominent location on front for custom imprint/logo. Includes two magnets. Size : Over All Size: 5 1/2" x 8 1/2"
Imprint Area : 5.25" x 2"